Labour mostly kept a distance from the TPPA protests in Auckland yesterday. They have also tried to keep a distance between anti-TPPA and anti-trade. But not everyone in Labour is on the same page. On this day in 1985 the then Labour Government stood up for the rights of New Zealanders. It refused entry to the USS Buchanan after the US Government would neither confirm nor deny the warship had nuclear capability. Fast forward 31 years and today the Labour Opposition is again standing up for New Zealand sovereignty which the TPPA undermines. I’m not sure they are onto a winner with this approach, it’s just one of many mixed and muddled messages on the TPPA and is unlikely to get much traction with the TPPA protest movement, nor those who see trade agreements as a necessity. This is odd from Little, in particular “John Key’s handling of the deal after it was signed”. The TPPA was only signed yesterday, about the same time this statement seems to have been posted, so dissing Key’s post-signing handling is unjustified. Litle also did a live chat about the TPPA on Stuff. If Labour opposes the TPPA why wasn’t the Labour Party more involved with the anti-TPPA protest today? We’re opposed to the TPPA in its current form because compromises to New Zealand’s sovereignty are not justified by the meagre economic gains. A number of Labour people are involved in today’s protests, including MPs who’ve spoken at rallies around the country. But Labour involvement with the protest was low profile, especially with Labour’s front bench MPs. Opposition politicians and union members were among those in attendance, with several sharing their concerns about the deal. Labour finance spokesman Grant Robertson said the TPPA was not a normal trade agreement and required New Zealand to sacrifice too much. Robertson said the issue was “far from over”, and Kiwis opposed to the deal needed to continue their protests. Standard Labour talking points on the TPPA. Nothing from Robertson about it on his Facebook page. Jacinda Ardern seems to have kept her distance from the Auckland protest, and obviously Phil Goff and David Shearer would not be seen supporting the protest. Meka Whaitiri was there, interesting for Labour’s Associate Primary Industries Spokesperson to be against a trade agreement that will benefit primary industries. 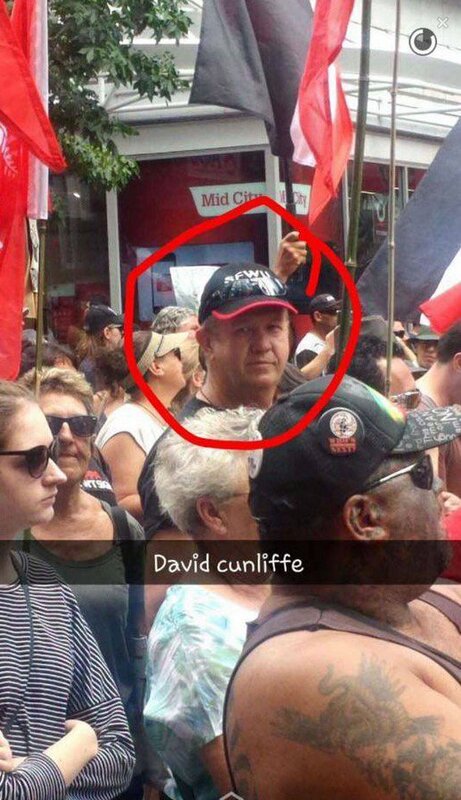 Labour’s trade spokesperson David Clark doesn’t seem to have associated with any protests. Phil Twyford was at the Auckland protest as this photo with Whaitiri on his Facebook page shows. As Spokesperson for Auckland Issues and Associate Spokesperson for Transport (Auckland and Ports) Twyford could be out of step with Auckland business and export interests there. Today, I joined thousands of Kiwis in protest against provisions in the TPPA that would undermine our sovereignty. Great to see people from all walks of life engaged and expressing their views peacefully and thoughtfully. The New Zealand Labour Party has always stood for free trade and always will – just not at the expense of our sovereignty. I am very disappointed in seeing Labour supporters marching alongside an anti semitic banner, and that you think it appropriate to re-post this image. This is not the Labour I wish to support. It may be hard to choose your neighbours in a protest march but choice of publicity photos can be an issue. Taranaki – King Country Labour added 4 new photos — at Aotea Square. ‪#‎TPPANoWay‬ March down Queen Street Auckland . Taranaki would presumably cover New Plymouth where Andrew Little has stood twice for Parliament (unsuccessfully, he’s a List MP). The sign in the background appears to be welcoming, but it’s the opposite, as Taranaki-King Country Labour show in another shot. That may not be a problem, the Trade Ministers of Australia, Brunei, Canada, Chile, Japan, Malaysia, Mexico, Peru, Singapore, USA or Vietnam may never need to deal with Taranaki-King Country Labour. The protesters remind me of the film “The Life of Brian” with the various groups squaring off for the right to represent Judea. Hillarious because, like much good comedy, it was a slice of life presented in a way that lets us see how screwed up many are. Labour are just useless – all over the place with their only consistency being inconsistency. Are Labour really likening their stand against an FTA, that includes Canada, Australia and Singapore is comparable to nuclear disarmament. These loons are trying to emulate Corbyn and thinking they are doing well because of the favourable feedback they are getting from twitter and facebook. Phil Twyford wearing a North Face jacket with a Labour Logo on it. Doesn’t that just say it all. American brand on one side, hypocrisy on the other. Thanks for spotting that, I’ve added a caption to the photo. Apart from the TPPA irony it’s quite odd using a branded jacket with a party logo like that. Does The North face sponsor Labour or something? The funniest part is that it will be made in China by someone named Lee. that is funny ,because you can’t see the irony..in light of your earlier statement…lol. I don’t understand the irony. What is wrong with wearing American clothes? Nothing. Unless you’re standing in front of a sign that says Corporate Traitors. I don’t get it. Is the protest against the North Face Clothing company? It’s because John Key is a shareholder in North Face. ‘Note the US branded jacket with a Labour logo’…scrapping the barrel here…very cute’ headline too…commas can be useful…eh. They are two different electorates, just as Dunedin is not covered by the Clutha-Southland electorate. Here’s a question. Have protesters ever been wrong? Woman’s right to vote. Will the TTP protesters be proven right. History suggests so. You make a good point, apart from the thousands of street protests that didn’t have any impact. This one won’t either. Why not? Because it’s a fake protest. They’re protesting against the government for the sake of it. Last time it was asset sales. Next year there will be another reason. Go back to the 60’s and ask any one of the protesters in the Vietnam War protests, what they were there for. They would have given you a passionate, life and death answer. Same at the Springbok Tour protests. Yesterday, nobody had a clue. It was Twitter/Facebook slacktivism taken to the streets. And it’s two faced opportunism on behalf of Labour. Comparing this TPP rent-a-crowd with some of your causes above is beyond pathetic. I’ve asked people why they are in favour of the TPPA ,and they are not really sure,vague reference to more trade being the only flimsy rationale.So surely the topic is worthy of discussion ,for and against. Next time you talk to someone, ask them to help you find the Space bar. next time you talk to someone ask them to help you find the…Titanic. Blazer, do you get a thrill out f being so obnoxious. Look at all of your comments in this thread and then tell me that you meant it when you asked for the pros and cons to be argued. We went in depth through this days ago but you were so wrapped up in insulting differing opinions you obviously did not do your homework on the information already provided. You have added nothing of merit or balance to the question and in my view need to shut up and listen to your betters. you can add arrogance to your list of….virtues! No, he is simply correct. You, unfortunately, are a superficial, supercilious fool. Open your ears, shut your mouth and learn something so you can eventually contribute something worth listening to. Blazer: Anyone can just diss any comment they don’t like with a rubbish one-liner but in the end you never put up a decent, detailed argument for any of your positions on things. Hence why you are quite rightly labelled a troll. to the 3 mushketeers…verbosity does not make an arguement compelling.Brief bullet points are more effective imo,instead of waffling on with unsubstantiated opinion,I have pointed out how feeble and puerile your namecalling is to no effect.Look at the TPPA discussion,the whole document is lacking in detail as to how it will benefit this country,and no one has been able to make a case for it being a ‘free trade’ agreement.The pro advocates resort to all sorts of diversions…rent a protester,just opposition for the sake of,anti U.S,and so on…!So intelligent respectful discussion is a two way street,not selective and inconsistent ‘guidelines’ on how to,by 3 quite clearly right wing protagonists. Simply put there are facts to be pro-TPPA (reduced tariffs, opening new markets, ability to pull out of the agreement with only six months notice, better legal protections for our businesses working in other countries etc) but I have yet to see one ‘fact’ as to why I should be anti-TPPA? That is essentially what the argument bores down to. Apart from everyone involved including all our exporters. But what would they know – Blazer has an impartially open mouth. The problem with that question is that the protesters can always claim their protest achieved something, no matter how small or irrelevant that may be. It may be just the fact they got on tv for a few minutes. For example take the well publicised occupy movement: Wikipedia – The Occupation Movement in New Zealand has been constantly criticised in the press as not accomplishing anything, and it has been slighted for being made up mostly of poor, unemployed people. The contributions of the Occupations and the movement as a whole have been largely ignored and under-reported in the New Zealand press, which has been hostile. The Occupiers themselves point to contributions, some tangible, but most esoteric. The large-scale worldwide occupy movement achieved zero, but I’m sure they will still say it was successful in gaining publicity for their cause. Unions in this country have protested strongly against a lot of govt policies that never caused the world to fall in (90 day law a classic example). Blazer, have you read the TPPA summary put out by MFAT as the lead Government Department for NZ in the TPPA process? Have you looked at their web site to see the summary of pros and cons for the TPPA? Have you read the three summaries I have provided from the US Congressional Research Service on the TPPA, Agriculture and today on the Strategic implications of the TPPA? Because if you had done all of that, which I have, you would see just how stupid your assertion was that no one had looked at the pros and cons fo New Zealand of membership. Let me save Blazer answering……..
Blazer: Those are all non-independent sources of information therefore I remain unconvinced. Now go back to the hole you came from loser!